These stories are beautiful because they are honest. In 1947, India gained independence from the British empire and also seceded what is now known as Pakistan. This month marks the 70 years since. The aftermath is still fresh, so too remain the stories of the lives affected. Louis Mountbatten, the last British viceroy, proposed the division as a solution to mounting religious conflict, to which the prime minister, Jawaharlal Nehru, reluctantly agreed. Two populist states were created, with Muslims on one side and Sikhs and Hindus on the other. It was a violent exodus that tore Punjab, families, friends, and lovers apart. It produced one of the largest mass migrations in history. BBC’s new series “Partition Voices” stitches past and present through stories told by British-Asians and Colonial British who lived through the partition. The series contextualizes lived experiences and the reverberations of them. While the effects of colonization are still felt today, India’s internal conflict also continues to exist in tandem. Most of those whose ancestry can be traced to the Indian subcontinent and Pakistan probably have great grandparents or grandparents who went through the partition or were alive during it. The second episode “Aftermath” opens with a love story about a Hindu man in love with his Muslim neighbor. His family left Pakistan during the partition. The main states that were ripped apart were, Sindh bordering the Arabian Sea, Bengal in the east, and Punjab in the west. All were portioned out between India and the newly formed Pakistan, displacing millions who found their ancestral homes caught between the two countries. The Punjab region was hit with some of the worst violence. My great grandfather, like many people during the time, was a Sikh man who opened his house as a safe spot for Muslim people in transit. The state was split into the east gate to India and the west gate to Pakistan. The gates still exist today. 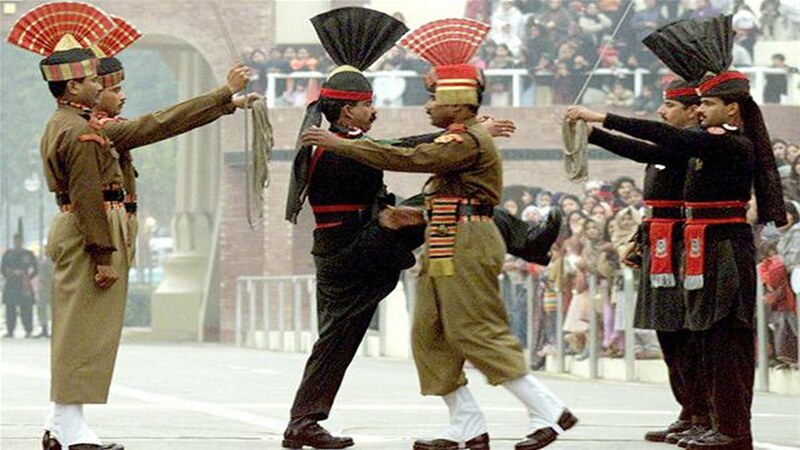 It is now known as the Wagah Border, where Pakistani and Indian soldiers perform the opening and closing ceremonies of the gates as hundreds of people shout “JAI HIND” and “PAKISTAN ZINDABAD” in cheerful rivalry. When I was 14, during my first trip to India, I was on the India side, shouting “Jai Hind” at the other side. I didn’t understand it then. I was enamored with the energy and ritual. But tension and pain continue to be swept under the thin veil of protocol. The Pakistan-India border is one of the most complex borders in the world and continues to face conflicts. It is a highly secured area. “Partition Voices” is a treasure laden with beautiful and painful anecdotes connected by songs, poetry, and hymns. Listening is comforting and nostalgic when it’s not heart-wrenching. The speakers share childhood experiences of what it was like to be politicized. One speaker remembers learning patriotic songs in school, ones that my father still can recite from heart today. My father, like the speakers, also grew up reading British literature. His American English is mixed with British English. Both the acute and ongoing phases of the partition left their mark on the social, cognitive, and class structures in India and Pakistan then and today. These are experiences generations carried with them across the world in diaspora. In her essay, “India’s Imagined Worlds,” Rudrapriya Rathore writes that “Seventy years after Partition, India becomes, in our sentimental imaginations, both sweepingly general and intensely personal.” The Partition series counters this statement by crystallizing the diverse experiences of people who experienced the partition era firsthand. They are stories I can see myself in. They are stories that help me understand myself. The stories are honest summations of what people remember through the eyes of their hearts, punctuated by pertinent historical facts. They capture the complexity of human experience and the threads that pull people together: love, music, poetry, friendship, family, loss, and conflict. In this program, you don’t need to call on your higher thinking. It does it for you. All you have to do is listen. I was left with the revelation that the issues in these stories–ones involving class, religion, and racism–still exist in the diaspora today. The diaspora is not limited to shared ethnicity–it is the shared experience of how people navigate socio-political structures within and outside of their global community. The politics of repeated histories are veins coursing through class structures, cultural artifacts, art pieces, family dynamics, physiological trauma, and our everyday lives. This series reminds us how story helps us make sense of our disconnect and how much our lived experiences are the truest, rawest accounts of history.